Founded by Mike Corsie with just a single truck and mower, our exceptional reputation for quality and timely service has helped us grow to expand our service area to much of Southern Coastal Maine. Our team is dedicated to using the latest materials and techniques to deliver beautiful results that will stand the test of time. Mike’s commitment to quality, is evident in the team of professionals currently employed with Terrapin Landscapes. Choosing to forgo the usual “summer help” hiring practices of traditional lawn care companies, Mike has built the current staff of full time professionals at Terrapin Landscapes, based on their education and skill level, passion for their craft and desire to be creative. Terrapin has participated in training by the Maine DEP to be certified in Erosion and Sedimentation Control, allowing us to work in environmentally sensitive areas in the Maine Shoreland Zone. This dedication to best management practices carries over to our design work, where we strive to promote native permaculture gardens and wildlife and bee friendly landscapes. 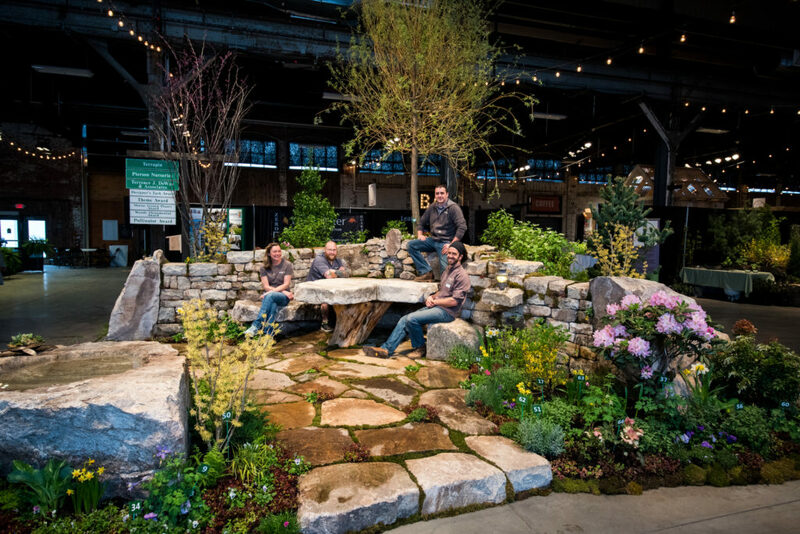 Our attention to detail and precision installation techniques allowed our entries to win several awards at the 2017 and 2018 Maine Flower Show. Terrapin has also been awarded “Best in Service” for 3 consecutive years by Houzz.com. Today, Terrapin has grown to enjoy a reputation as one of Southern Maine’s premier landscape companies. From our base in Kennebunkport, Terrapin Landscapes offers its clients professional landscape and hardscape design and construction, near and far. Mike Corsie has always been passionate about the outdoors and honoring the environment. Starting out as an environmental science major at the University of New England, Mike landscaped through the summers. Finding his interest peaked and his days fulfilling, he changed his major and school to pursue his passion. He started Terrapin in 2001 and has grown the company into what it is today. It’s success being attributed to Mike’s focus on one simple principle: to provide each customer with high-quality personalized service. With Mike being certified in Erosion Control Practices through the State of Maine he brings a new level of professionalism to the business. This certification assures that Terrapin Landscapes is not only conscious of the environmental laws and reasons why erosion control is important, but they practice it daily. Mike lives with his wife and 2 sons in Kennebunkport, Maine allowing him to practice his strong belief to support one’s community and stay local. You will see Terrapin’s support at many local charitable events. The number one question Mike is asked… “Why the name Terrapin?” The reason is his favorite childhood album, Terrapin Station by the Grateful Dead. In his spare time, Mike spends time with his family and you sill always find Mike at any opportunity for live music. 1994 Graduate SUNY New Paltz with 20 years landscape/gardening experience. Justin joined Terrapin Landscapes following a lengthy career as a sales representative in the pharmaceutical industry. The growth of Terrapin Landscapes (Terrapin Landscaping back then) coincided with Justin’s disenchantment with pharmaceutical sales and in the Spring of 2007, Justin followed his real life passion for gardening and everything outdoors, a move made easier by having worked on landscape crews throughout high school and college. Today, as Operations Manager, Justin is often the point of contact for customers and is committed to maintaining quality control and providing personalized service thru getting to know clients, understanding their desires, and maintaining their vision for their home. Email Justin or call him at 207-590-3802. With 12 years of experience and apprenticeship, Jeremy is the best at what he does. His meticulous yet speedy touch comes in handy when laying stone. He has a passion for natural stone and large scale projects, which is evident in the finished product. When he’s not working Jeremy enjoys spending time with his family and being outdoors, especially on the ski slopes. Jeff is entering his 15th year as a professional stone mason. In the course of his career he has developed a wide array of skills that have put him in the unique position of being capable of concrete work to dry stone features, mortared stone veneer to dry stone walls, indoor fireplaces to outdoor water features, flagstone patios to pizza ovens. Through all these experiences, his passion resides in dry stone walling; a traditional craft he has honed at home and abroad. This passion has brought him to England to learn from a Master Craftsmen, to Canada to work alongside some of the best in the craft, and to multiple states to build alongside other passionate craftsmen and women. To date, he has earned a Level 2 certification with the Dry Stone Walling Association of Great Britain. His career began in Kennebunkport as a mortar tender to his brother, Brian, and evolved into a decade-long journey west from Santa Cruz, California to Bend, Oregon. In Bend, he built a successful business offering a full-range of masonry services; providing functional and artistic stonework in an adventurous community that thrives on the outdoor experience. Now back in southern Maine, Jeff has found a home with Terrapin Landscapes, where he’s contributing his quality craftsmanship to a flourishing company. Dry Stone Walling – Simply put, dry stone walling is the construction of a stone wall with natural materials and without the use of mortar or cement. The craft and traditions of dry stone walling have been maintained in large part by groups and associations any region where stone walls have a history. The most prominent of these organizations is the Dry Stone Walling Association of Great Britain, a British non-profit that has been in existence for 50 years and disseminates dry stone walling information to members and non-members in an effort to preserve the craft, educating future walling enthusiasts and professionals alike. Walling incorporates a handful of functional tenets that guide how a builder chooses the stones they build with and how to properly set those stones as they go. A dry stone wall has the capacity to last 100-200 years (and longer) when the craftsperson utilizes these rules to the best of their abilities. There are various styles of walling around the world that have evolved as a byproduct of the materials available and the engineering methodologies of the people who developed them. Mastery of this craft is a lesson in practice, time and patience. Building on the basic tenets, a vast array of stone feature work is possible to the skilled craftsperson. UNE 2012 Environmental science and SMCC 2014 horticulture graduate. Employed with Terrapin since 2016, Cody’s enthusiasm for environmental restoration and permaculture make him a vital advocate for Maine’s native species and ecosystems. His artistic talents and love of nature are expressed in each and every project. Cody would love to consult with you about what is best to plant in your garden and he’d be even happier to maintain it for years to come! Call Mike TODAY (207) 251-0558 or fill out our contact form to discuss your next project.